If there is one dessert that could bring me to my knees, it is Dark Chocolate Mousse. The smooth, creamy, silky texture, combined with a rich dark chocolate flavor takes my mind to a place where nothing else matters. Whenever we go out for dinner, I almost always ask for the dessert menu, knowing that there’s a 99% chance that everything will contain eggs or gelatin (unless of course I’m at one of my favorite vegan restaurants). Even then, I can’t help but check for an egg-free, gelatin-free Chocolate Mousse on every menu. As you can guess, I haven’t had much luck, so I took matters into my own hands. 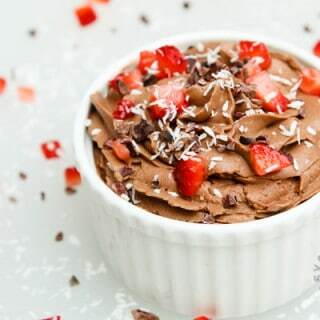 It’s surprisingly taken a long time to make this mousse. In the past I’ve whipped up some dark chocolate ganache and used it for frosting, which I was also able to pass off as Dark Chocolate Mouse. 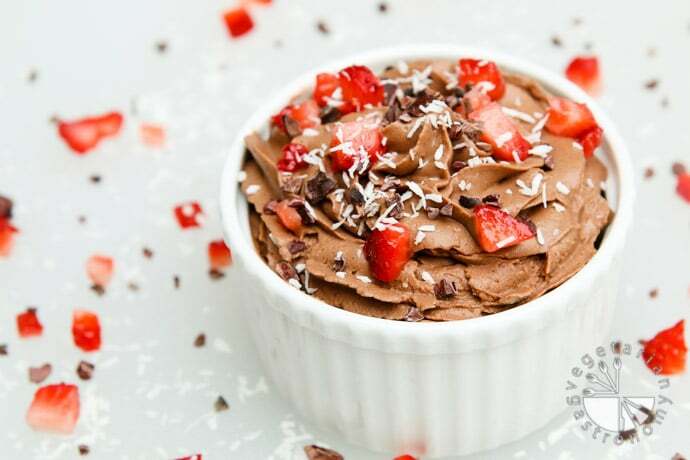 This recipe uses Coconut Whipped Cream and takes Chocolate Mousse to the next level. 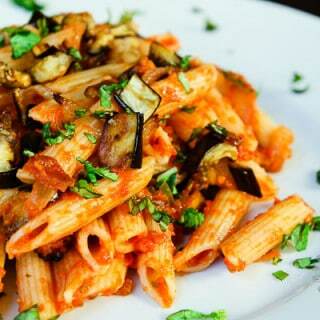 Not only is it much healthier and very easy to make, but it’s also vegan and tastes amazing! If you cannot find dark cocoa powder, I’ve found that the Trader Joe’s brand cocoa powder is on the darker side and works well with this recipe. This dessert can be enjoyed plain, or combined with your favorite toppings. One of my favorite combinations is to sprinkle shredded coconut, strawberries, and cocoa nibs on top. 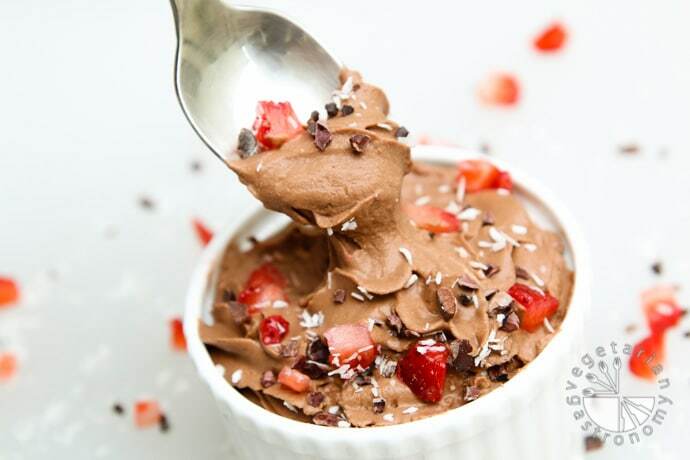 I have made a few batches of this Mousse now, and my family polishes it off pretty quickly! 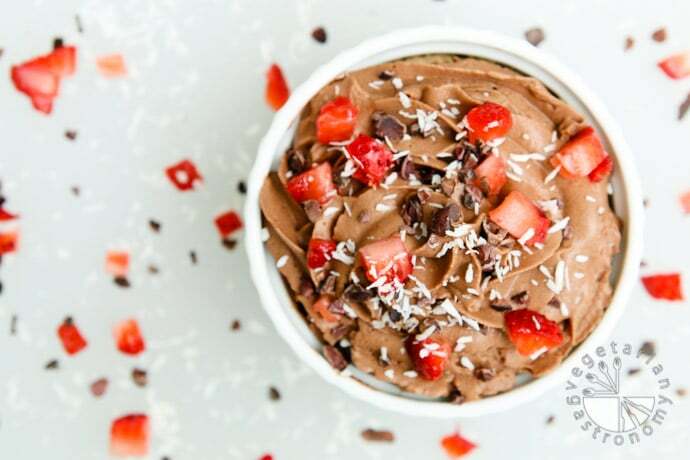 This healthier 4-ingredient decadent mousse is dairy-free, rich and creamy, and easy to make! Be sure to use full-fat coconut milk for this recipe, otherwise it will not work. They also sell coconut cream, which is the thickened part of the coconut milk once it's been refrigerated. This should work as well, but you will need to add more sweetener if using an entire can of coconut cream. If your can of coconut cream does not solidify, then the recipe will not work. 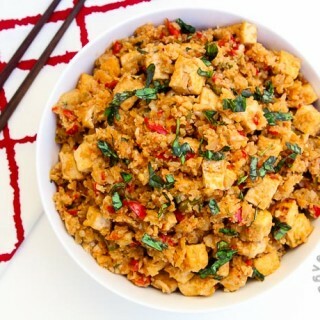 I have used Thai Kitchen Coconut Milk for this recipe many times and it's turned out great. I prefer to use powdered sugar, but you can use any other sweetener, such as maple syrup or agave nectar. They taste good and work well. I prefer Trader Joe's Cocoa Powder - it is slightly on the darker side than other brands. Powdered sugar in this recipe is also preferable to other sweeteners because it has a little corn starch in it (see the ingredients on any powdered sugar package), which helps stiffens up the final product. Hi! Thank you for the additional information. I knew that powdered sugar is preferred because it helps stiffen the final product (mainly because i make buttercream frosting all the time with powdered sugar), but did not think to realize it was the corn starch in it. Thank you!! Finally made this today, and it is delicious! I had about half of a can of TJ's coconut cream at home, so I used it, and it was perfect. Both Hubby and I enjoyed it, and we saved some for Daughter :). 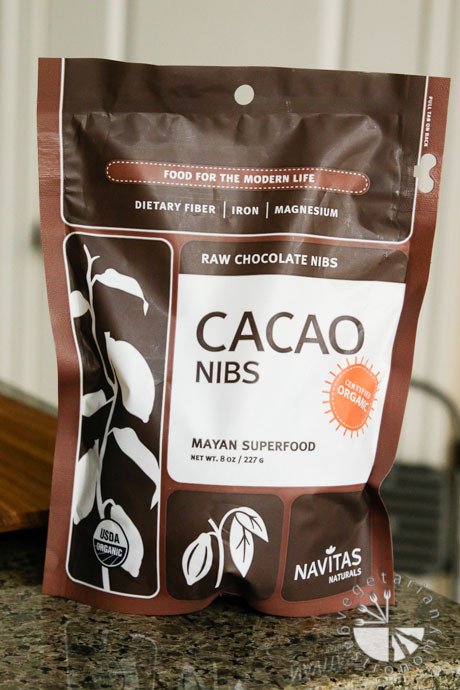 Next time, I'll be sure to have cacao nibs at home! This is one of my favorites...so good and easy to make! Glad you guys enjoyed it! Welcome to the world of coconut whipped cream! And glad to hear that the TJ coconut cream solidifies and works well. Thank you for the comment! What am I doing wrong? I froze a can of full fat coconut milk, but the entire can is frozen solid. There is no liquid in the can and I have no idea what I did wrong or how to proceed. Help!! 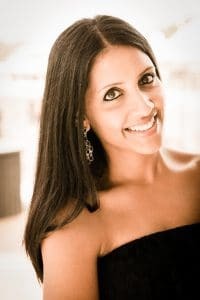 Anjali, I am a case. I read the first two lines of the recipe and inverted the verbs. I put the can of coconut milk in the freezer, not the fridge. Now that it is thawed out I was able to separate the water from the cream. Thanks for responding and I apologize for not following the directions properly! I made two batches---one following your recipe and the other with a pinch of cayenne pepper and coarse salt. Both are delightfully delicious! Thanks for the recipe, truly. So glad you enjoyed the recipe! Adding sea salt and cayenne pepper are on my list of things to add next time I make this recipe, so nice to know it turned out good! I was also thinking a pinch of cinnamon =) Thank you so much for the feedback! This is too good - a new addiction! especially with crushed nuts on top - yum! and ready in 5 minutes! So glad you enjoyed this recipe! I love the use of coconut whipped cream...it's one of my favorite go-to desserts. Thanks so much for the feedback! Hi! I actually just recently started quantifying my recipes in terms of nutritional information, how many servings, and the exact serving size. I have yet to go back and update all the other recipes with this info, but I am chipping away slowly. As for this recipe, it makes about 3 servings. I am not quite sure what the serving size was, but it's intended for dessert served for 3 people. I will try to make this again myself in the next 2 weeks so I can tell you exact numbers...I'm craving it again anyway =) sorry about that, hope that helps a little! Yes I would recommend multiplying everything by 4. Enjoy! Hi there, thank you for the link and the information. Just so you know, I am not a nutritionist, nor have I ever claimed to be. Over the past 2 years, I have made a conscious effort to do my best to move more towards a plant-based diet, avoid processed ingredients, and use natural sweeteners and healthy fats, although I do currently believe that everything is okay in moderation. These are all personal choices that fit well for me personally. That being said, I use a variety of different oils when it comes to baking and cooking, coconut oil included as well as others. I actually love the flavor of coconut and do not feel I have anything in excess for it to be an issue. 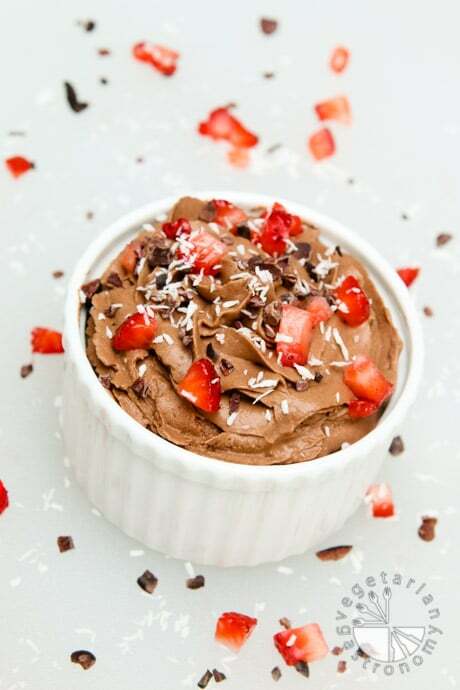 Also, I do believe that this coconut milk-based vegan mousse is healthier than it's non-vegan counterpart, which is typically made from eggs and heavy cream...this is what I was referring to in my post. Again, that is my own opinion and based on my view points only. My blog is not a health blog. That being said, I'm always interested in reading more on nutrition, ingredients, and the different views...thank you for the information and sending me the link. I will be sure to look into it more. Happy Cooking! If one has coconut cream available would that work, or does it have to be full fat coconut milk? If you can use the cream it seems one would separate it like you do the milk, but probably have more fat than with the milk? Looks delicious! Yes! You can definitely use coconut cream here in this recipe instead! You need the thick fat part. Great idea!! Thanks, and your chocolate cake sounds delicious!! How far in advance can this be made? Could I make it the day ahead of eating it? Absolutely! I make it the day before or even 2 days before all the time. This sounds wonderful! Do you have thoughts on how you would alter it if you wanted to add espresso for a coffee flavor? More coconut milk and a tad more sweetener? I would make the recipe as is, and add some espresso powder for the coffee flavor. Adjust sweetener as needed, but you shouldn't need more coconut milk! that sounds yummy...let me know how it turns out! I needed a quick, vegan & nut-free dessert, and this did the trick! I brought this to a dinner party, and everyone was amazed (note - I have a pastry degree, so I'm expected to always bring quality desserts wherever I go). I quadrupled the recipe, used 2 cans whole-fat coconut milk and 2 cans coconut cream, as well as mixing half black cocoa and half unsweetened cocoa and served with raspberries. I kept the measurements for the sugar and vanilla this recipe called for (at 4x), as I didn't want this to be overly sweet. Also, I didn't read the recipe throughly when grocery shopping (rookie mistake, I know), and only put the coconut milk in the freezer a few hours before making and it still turned out perfect. Thanks! I'll be using this again. I travel to Paris quite often on business, and when I come home, I always try to duplicate my favorite French recipes. I have tried many times to make chocolate mousse, but it never quite lives up to what I've had in Paris. My daughter is vegan, so for Mother's Day dinner this year, I decided to try your recipe, thinking "I'm sure it won't be as good as non-vegan, and I'm positive it won't be as good as in Paris." I was so wrong on both accounts. I can say, in all honesty, that this is the best chocolate mousse I've ever had, vegan or non-vegan. Merci boucup! Wow what an amazing review!!! Especially from someone who seems to know her chocolate mousse. We went to paris years ago as well and chocolate mousse is my downfall, but i was never able to have it...and this version really hit home with me! I also love coconut and that darker flavor. So glad you loved it and again thank you so much!! BTW...if you see this...I'm going to paris with my family this summer and would LOVE any good vegan food recs there if you have any! I heard their vegan scene has gotten much better since we last went. Thank you!! !